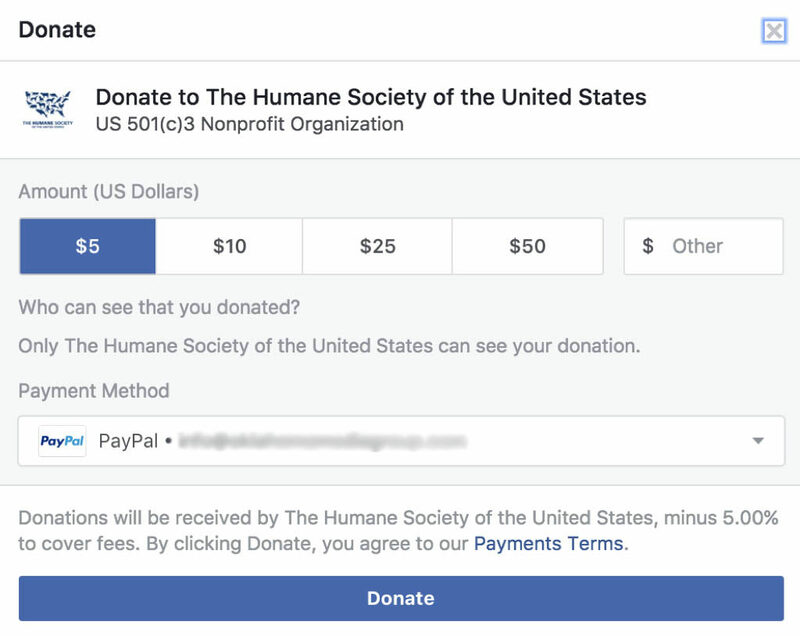 Facebook now offers a way for nonprofits to collect donations, right inside your Facebook page. This goes beyond linking a donate button on your FB page back to your website or PayPal. This is Facebook acting as a payment processor, processing the transaction and actually depositing the donor’s money (minus fees) into your account. It happens securely right on Facebook, and works in the mobile and desktop environment. UPDATE December 6, 2017!!! Based on early reporting from some organizations, and what Facebook released in its Social Good Forum on November 29, ALL FEES will be waived on donations made through Facebook’s giving tools. That means no 5% fee to Facebook to pay for their platform and reach. AND no 3% credit card processing fees. Facebook is going to absorb all fees, so that 100% of every donation actually goes to your organization. This is HUGE! The first question! The total fees (Facebook’s fee plus credit card processing fees) are about 5%. This is less than some online giving platforms, but more expensive than just using a plain service like PayPal or Stripe. However, you have the potential to reach a much larger donor base through Facebook, and they are providing the secure environment for your donation to take place. This also allows supporters to create their own campaigns and fundraisers for your organization, also within Facebook, and share them. This is really the biggest benefit of setting up this feature on your Facebook page—it puts the power of fundraising in your supporters’ hands, and that is where the real power of social giving lies. Click here to see some screenshots and get an explanation of the process from Facebook. It takes about 1 week to get approved. So get started NOW! #GivingTuesday is coming up on November 28, and for that day, Facebook is waiving ALL fees, AND the Bill & Melinda Gates Foundation is matching donations! Your CEO or executive director’s name, date of birth, and business address. A legible bank statement or official bank letter dated within the last 3 months. This SEEMS like a lot of details. But ANY tool you use to collect donations is going to require this information so that it can put money in your bank account—just look at it that way. Get your organization’s application completed, then wait. Once you’re approved, you’ll be able to collect donations through your Facebook page. See it in action here and here. You can also continue to collect donations normally through your website and other channels that do not involve Facebook. So even if you are ONLY doing this to take advantage of the #GivingTuesday promotions, that’s reason enough. And you may be surprised how many other people will donate this way. We went through all the steps you’ve listed above and got an error message that says Failed to create your organization. Any thoughts about what happened there? How frustrating! I have seen this happen when the site just has a bug or stops responding for a few minutes. You may have submitted right at a time they were doing a database update or something. I would suggest trying again and see what happens–or did you already try multiple times?